Pawhuska's H.S. Baseball team waits their turn to play (-vs- Skiatook) Wednesday. They will be Collinsville's opponent Saturday at 1pm. 3-Run Swing! 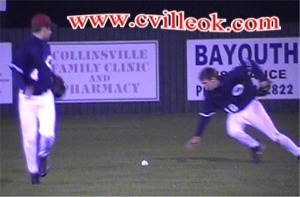 -- Collinsville's Jesse Bugg brought in three runners ahead of him and ended up on third in the 4th inning against Grove March 24th. Jesse scored on the next play (a Josh Compton RBI) for the Card's 6th and final run. 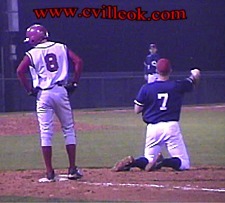 Collinsville had scored twice in the 1st inning. 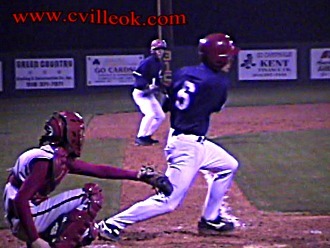 Grove scored the final 3 runs in the 6-3 game. 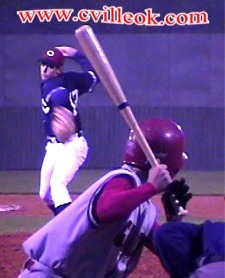 Chris Triebt (left) picked up the win for Collinsville (against Grove March 24). Chris pitch into a based loaded no-out jam in the 1st but worked out of that and pitched 6 innings. Ricky Rimpley pitched the final inning. This Collinsville batter was one of several batters (on both sides) hit by pitches in the Collinsville -vs- Grove game March 24th. 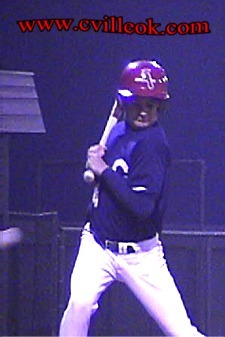 Cory Flynn had the game's only serious injury when he took a ball to the face during the 4th inning warmup at second base. The Cards had a few fielding miscues against Grove on Wednesday. Collinsville's first baseman, Josh Compton (left), looks like he might be practicing to be "short" stop on this play against Grove.